Hope everyone has been getting their share of waves this past week on the south shore. If not you didn't miss anything. It's not very often I get up before the sunrise but if I know the winds will be slowing down and the waves are small then get I motivated to dive. 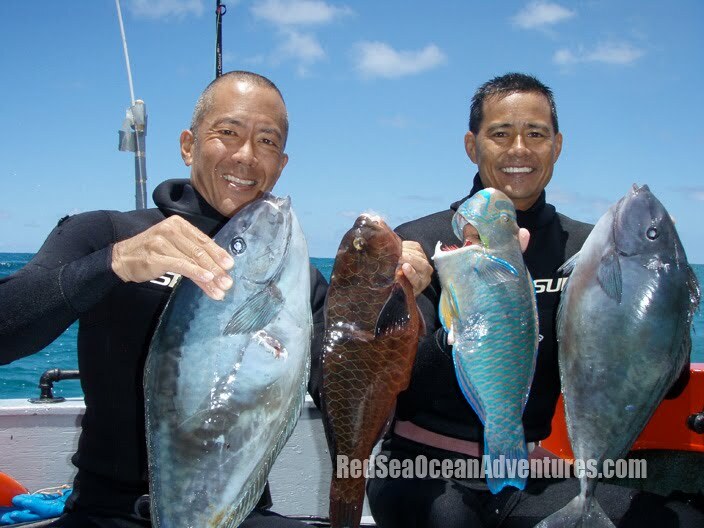 Keith Yamane joined me today along with Captain "Cat" behind the wheel on board the Red Sea Boat for a quick jump in to check my favorite spots. We needed a few uhus for some friends and of course couldn't help but plug a few opelu kalas for sashimi. After we got a couple we headed to the ono grounds and did a little chumming/burley/palu/puke-ing. 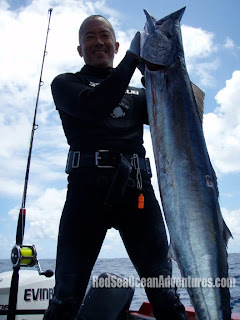 Water was little dirty so I dropped down to investigate this huge 10# rainbow runner eating away on the bottom 100 ft. below, then out of nowhere this ono (wahoo) shows up out of the blue. I quickly turn my 120 cm. railgun on him and take a shot. My reel jams and I'm running out of air so instead of letting go, I "horse" the fish up hoping not to black out while making hand signals to my partner Keith to give him the back up shot. Keith drops down as the ono does a dance squirming left to right trying to shake off the single flopper barb. But cracker jack Keith nails him good and we were ready to go in by noon. The ono weighed in just under 30# and everyone was happy and ready to go home! Hope everyone had a "HAPPY FATHER'S DAY"! We were over in Maui filming and got some awesome footage with Hawaii Skin Divers, Lance Otsubo, Wayde Hayashi, Kimi Werner, and Kimi Apiki. Lance is a local boy who knows where to go and thanks to his Dad, Raymond Otsubo and his friend David Miyaki we were able to get a lot done in a day and half of diving. Later we met up with Brian Yoshikawa (Owner) of Maui Sporting Goods and we did a autograph session with HSDTV host, Merlinda Garma. Their shop is at 92 North Market Street and they have everything from diving, fishing, boating tackle and it was a diver's dream store. 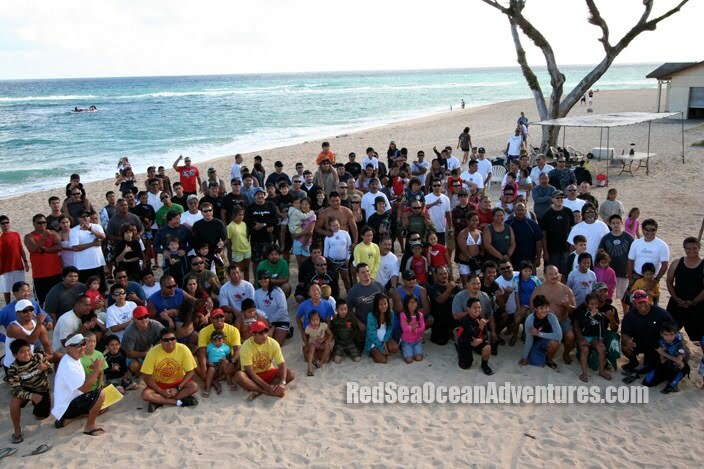 Then we went to film the Daniel Perreria Memorial Spearfishing Tournament at Baldwin Beach Park where the whole community came together to support this huge event. 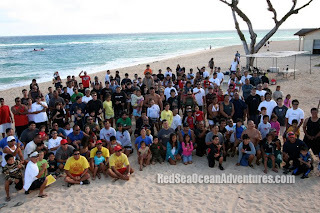 With over 90 competitors ranging in ages 3-18 years of age, it was all about the keikis of Hawaii. Brian and his son entered and even got interviewed by Merlinda Garma on their catch. There were so many donations and prizes everyone went home happy. We were thankful for the invitation this year to cover this event. A big Mahalo to all the sponsors, helpers, and families who continue to support this great cause to help our keiki's who are battling cancer. Although Maui has lots of people, its neat to see their community come together to help support each other. It's no wonder the phrase, "Maui No Ka Oi"! This weekend is the Ahi Fever fishing tournament at Waianae boat harbor so if you want to see some fish and willing to battle the crowded pier then make it over to the westside. They have a huge jackpot for the winners totaling about $67,000. As for me, I'll be home planning our next Red Sea Ocean Adventure. We were able to catch some big tunas (500 lb+) on a previous trip and hope to get some tuna this year. Another beautiful weekend in Hawaii! Hope everyone had a nice long weekend with the Kamehameha Day Holiday. Our friends from Japan, Toda-san and Takami wanted to go on the Red Sea Boat so off we went to the wild wild west. We did a few drops at the ledge and the current was mild but enough for some good action. I told the gang today we were going blue water today and it's hit or miss, we may find something and we may not. Our first sighting was so funny, as someone through all our floats and guns in the water and as we entered in there they were...two big onos (wahoo) just sitting there staring at us. I had my 3 prong in one hand and made a b-line to my gun but it was too late, as they swam off. Our next drop, Kirby was able to spear his first Wahoo! It bolted for the bottom and after 10 minutes of struggle we put a second shot in and he was elated. I was stoked to be able to see him spear his first big ulua, uku, and now ono. Next on his list is a dogtooth tuna. Congratulations Kirby on a nice 30 lb wahoo! Lots of sashimi for this week! 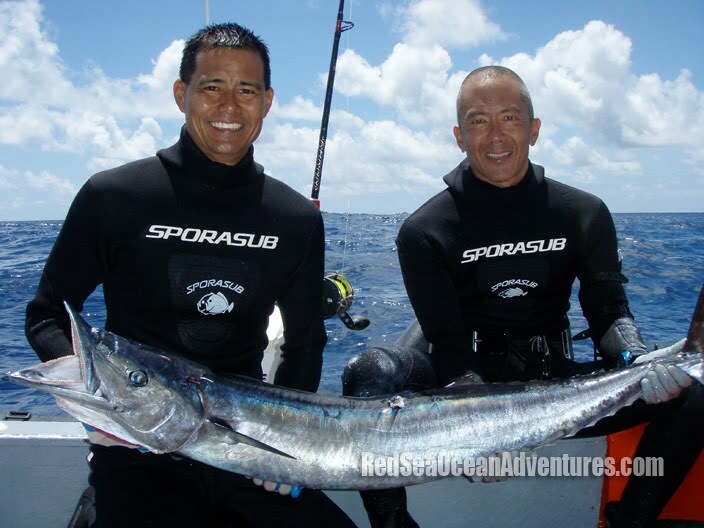 2009 US NATIONALS SPEARFISHING CHAMPIONSHIPS now airing on OC16. 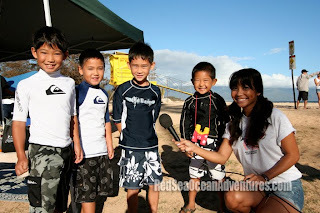 You can also see Hawaii Skin Diver online at www.oc16.tv anytime it airs in Hawaii. 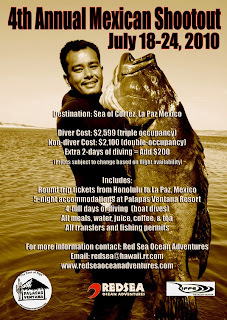 See our show schedule on http://redseaoceanadventures.com/hsdtv/ Thanks for watching! 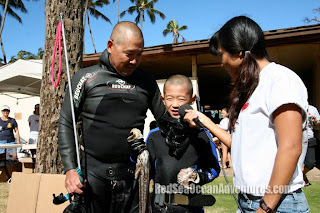 We went to Maui Sporting Goods (MSG) to try on some new dive gear! MSG has everything you need from masks, fins, guns, wetsuits, floats, and then some...Now all we need is some fish for our BBQ tonight! Kurt Taguma (yellow shirt) and Wendell Ko (tan shirt) are the guys to see if you have any questions on spearfishing gear. So next time you are on Kapahulu Avenue drop by and say hello and pick up some new equipment for your next dive! 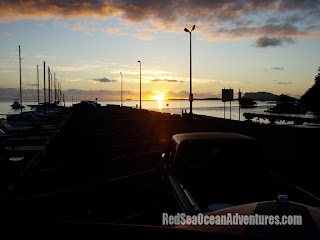 Today I woke up early excited to go diving! Got my gear ready, packed up the boat and as Erick and Travis came over we smelled something burning. My bildge pump was smoking and I must have left it on for days. 24 gallons of gas was right there and if we didn't dive I'm sure my boat would be on fire after blowing up. So we installed another pump and off we went to the ocean supermarket. Conditions were a little bumpy but good enough to catch a few fish for the week. We were targeting anything red in color and managed to get some goat fish, jacks, Mu, Uhu and prized aweoweo "Big Eye". I believe things happen for a reason and could only imagine what would have happened if we didn't dive today. 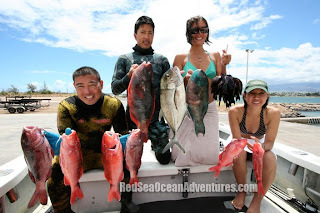 Ready to target some other types of fish than parrotfish and uluas? We will be filming for a future episode of Hawaii Skin Diver Television so contact us if you are interested in joining us. Wow June is here! Hope everyone had a nice memorial day holiday! 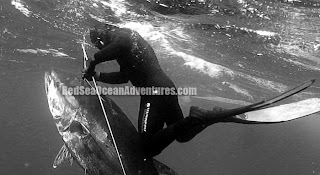 Did some diving with the boys but pelagics was slow this year:( but always nice to be on the water or should I say in the water. My dad made some killer poke and a platter of sashimi for dinner and it was so good! All I needed was 4 bowls of rice and miso soup and I was done.